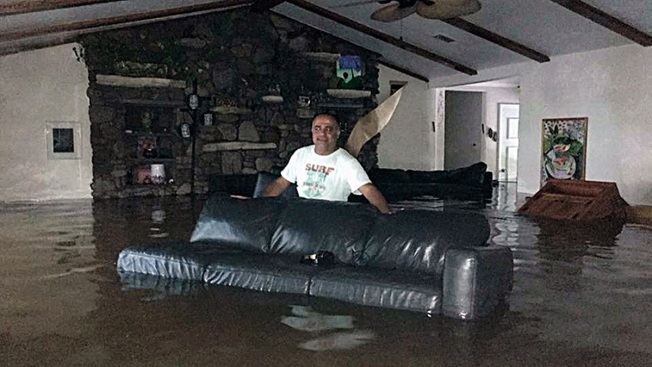 This Aug. 27, 2017, photo provided by Ramit Plushnick-Masti, shows her husband, Rafi, standing in waist-high water inside their flooded home in Houston's Meyerland neighborhood that was caused by Tropical Storm Harvey. At 4:30 a.m. Sunday, my husband, Rafi, woke me up. "There's water in our bathroom. We need to look around," he said. Our sunroom already had six inches of water. Outside, the water outside was right at our door. My son's room was picking up water from the backyard. We woke everyone and put towels at the doors. Seems silly now, but at the time it seemed the right thing to do. And then the water just started rushing in through the walls. Within an hour it was at my ankles. We moved our picture albums to counters. We picked up laundry baskets, clothes from bottom drawers and shoes. My boys — 10-year-old Eliran, 14-year-old Ron and 15-year-old Shaked — grabbed the summer homework they had spent hours completing and put it on top shelves — no way they were going to redo that! Laptops went to the kitchen counter along with tablets and phones. Text messages flew between neighbors: It was only 6 a.m. and the water was at the middle of my shin. A neighbor and colleague from work said he had more than a foot of water inside and was calling for rescue. I decided we could wait a little longer. Surely there were people in greater need. By 7:30 a.m. I knew we needed to leave. The water was just under my knees. I grabbed Ziploc bags and stuffed two pairs of jeans, two T-shirts, underwear and moisturizer inside. I took all the chargers and went to the kitchen. The water was at my knees. I called 911 and told them we needed to evacuate. I was still calm. I explained that we were fine for now but need to get out. Houston has seen hurricanes, tropical storms and floods. But even for me, a non-native Houstonian, it had been clear since Thursday this was not going to be a typical event. The days and hours that followed became a blur of activity. My mind was working overtime. I wanted to make sure my sons were safe. Food, gas and cash were also priorities. But then, there was work. I am the director of communications at the Houston Forensic Science Center (HFSC), the city's crime lab, and we had to make sure evidence was secure. As a former Associated Press journalist, my crisis management instincts kicked into high gear as the storm approached. The forecasts for Harvey were terrifying. Still, our Houston neighborhood of Meyerland was not told to evacuate, and since 2010 when we moved to Houston we had been through four floods. We didn't really consider fleeing. Either way, I would have had to remain in the city because I am an essential employee at work. It rained hard from Friday into Saturday, but it slowed down by mid-morning Saturday. Our family, along with many others in the neighborhood, went out to peek at our local waterway, Braes Bayou. It was high, but looked like it could take more rain. We went to the supermarket to buy strawberries, Klondike bars and peaches — hurricane necessities. And then, around 7 p.m. on Saturday, the deluge began. The skies opened, and massive amounts of rain fell. The weather report predicted more, but we went to sleep — until my husband woke me in the pre-dawn hours Sunday. As the water rose in our home and we awaited rescue, my two older boys went to lie down: one on the dining room table and the other on his now-floating bed. The higher the water got, the more polluted it looked. There were huge cockroaches crawling from the muck. At 11:30 a.m. there was a loud splash. The TV in the living room had tumbled into the water. The fire department had answered our call but could not say when they would arrive. My boys were getting nervous. The water was more than halfway up the lower kitchen cabinest. I called 911 again, and friends sent some phone numbers for the Coast Guard. Emergency dispatchers answered, but couldn't indicate where in the evacuation effort we might fall. The Coast Guard phone numbers were busy. We sat on the kitchen counters. The water hit the top panel of the dishwasher. It was 12:30 p.m. It was clear we needed to do something other than just wait. We had already posted pictures to Facebook of our inundated house. Now, it was time for some Facebook crowdsourcing. So I posted that we needed someone with a boat in Meyerland to get us out. The two older boys and my husband got on the roof to try to flag down boats going down what had once been Wigton Drive, but was now a roaring river. People shared the post, and quickly we got on an evacuation list put together by a neighborhood rabbi who had organized some people with motorboats to evacuate residents. The boys grabbed some clothes and we put everything in garbage bags. At 2 p.m. a boat arranged by the rabbi arrived. The water in our house was waist high. We needed to get out from the laundry room. The washing machine had turned on its side in the water, and so had the stand-up freezer. We climbed over it and out into the driveway. The water outside was over my head and I had to swim. On the boat were several other families, including two elderly people, a 6-month old baby and two dogs. As we made our way toward the local church that had become a shelter, the boat's propeller hit the ground and we all got off. Wading through knee-high water, with white plastic garbage bags full of clothing and laptops on our shoulders, we made our way toward the church, which had no power. There were at least 100 people there and no cots, but it was dry, and we made it our home for the night. We made a ravioli dinner, using a flashlight to see, and we slept on the floor. But we knew we were lucky. Others had water in their homes over their heads and had broken through their roofs to get out. Elderly people did not have their medicine. Everything we lost is material. We will rebuild, and our family is whole. At 11:30 p.m. Sunday night, as I was about to go to sleep at the church, my phone rang. It was the Houston Fire Department, calling to ask if we had gotten to dry ground — 16 hours after I had first called for help.